Balancing Jane: When Ethical Frameworks Collide: What Happens When Everyone is Right? When Ethical Frameworks Collide: What Happens When Everyone is Right? I've been thinking a lot lately about how we construct our ethical frameworks. The article that finally sparked me to try to put my thoughts together was Hannah Waters' "Death to the House Cat." See, a new study has found that cats are killing billions (with a "b") of birds and small mammals every year, endangering several populations to the point of possible extinction. This has prompted some people, perhaps most notably New Zealand's Gareth Moran, to call for stray cats to be euthanized and all pet cats to be neutered or spayed and kept indoors, even to the point--in Moran's case--of the eradication of their own population. Now I have two (solely indoor, and spayed, for what it's worth) cats, and that argument sent shivers down my spine. but they're cats, so they refused to cooperate. Of course, the suggestion that we euthanize stray cats sounds very inhumane. I'm an animal lover who has adopted pets from the Humane Society and believes in responsible pet ownership and humane treatment. Killing cats doesn't sound like it fits into that world view at all. The problem is that trap-neuter-release programs don’t work (3). Cat fertility is so high–a single female can have 3 litters of 4-6 kittens each year–that just a small percentage of the population needs to be reproductive to make up for the natural death rate. (Even if most of the kittens born end up dying before reproducing.) Additionally, trap-neuter-release isn’t even cost-effective compared to euthanasia, even if all the cat feeding, capturing and neutering is performed by volunteers (4). And, meanwhile, all those neutered cats are still doing what they do best: catching and eating small animals. She concludes that cats should be controlled through "humane killing, just like many other invasive species." The argument is one of conflicting ethical frameworks. On the one hand, there are advocates for feral cats who believe that their humane treatment is supreme in this debate. On the other hand, there are advocates for biodiversity that say the lives of the native bird and mammal populations should be more important. I'm not taking a side in this debate (and I'm not euthanizing my cats), but it did make me think of another complicated article I read recently. 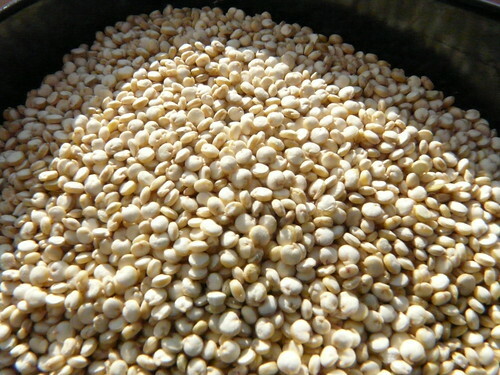 Quinoa has become something of a fad grain in the United States, and it is particularly popular among the "foodie" crowd. This Guardian article points out that many vegans tout the benefits of quinoa as a good source of protein without the ethical problems of food from animal sources. (I think the article relies a little too heavily on the assumption that it's mostly vegans increasing the demand for quinoa (when really, it's vegans, vegetarians, and omnivores alike), but the ethical question remains). Because quinoa is suddenly much more in demand than it used to be, the cost of it has increased so much that people in Peru and Bolivia, where it is grown, can often no longer afford it. That means that a staple of their diets has been priced out of their accessibility. There are two competing ethical frameworks in this debate. On one hand, there are ethical concerns for the treatment of animals, and on the other hand is the ethical concern for the people who depend on quinoa as a native food source. A wild deer requires no killing until the moment of harvest to produce some 40 pounds of meat, even from a smallish animal. The deer lives free of cages, electric prods, hormones or antibiotics. No other animals are trapped, poisoned or shot to bring it to maturity. The blood footprint of the venison burger may be less than that of a tub of popcorn. He argues that because traditionally harvested soy requires the killing of many animals through pesticides and pest control measures like hunting, the deer meat is actually the result of less animal suffering than the vegetarian option. Again, this is a question of frameworks. Which position do you privilege? How do you make your decision? The thing that strikes me about these three debates is that I think many of us can recognize the value of the arguments on either side. Even if I ultimately think that trapping and neutering feral cats is the choice I prefer because I am privileging the viewpoint of the cats, I can't rightly say that I don't see the point of the people who argue for biodiversity. Even if I decide that eating quinoa isn't worth the cost to Peruvians, I can't say that I don't understand the concerns of vegans who are trying to eat in a way that reduces cruelty to animals. So what happens when two groups have equally thought-out, justified ethical frameworks that cannot co-exist? What happens when those two frameworks intersect in your own life? How do you make ethical decisions when you can see the benefits of both? Can you think of any other examples where this kind of conflict arises? The cats issue is complicated to a great extent by the fact that man has domesticated cats. If they were simply wild animals, this would be a different question. When we bring an animal into our lives, breed it to alter its biology, and tame it to suit our need for companionship or entertainment, we alter the equation. Cats, like dogs and other domesticated animals that mainly serve as pets in the Western world, have been altered essentially to serve our non-essential interests. As a result of this, we cannot simply decide to kill them when they become inconvenient. Our responsibility to a species that we interfere with on the level that we have done so with cats (and dogs) is higher than that for animals which we have not domesticated at such a level. This isn't about sentimentality, but rather about the the responsibility we take on as a culture when we domesticate an animal. The reason that killing cats is different than culling deer during hunting season in order to make sure they don't starve is that we have not tampered with deer in the same manner. There naturally would not be an overpopulation of cats killing birds and other animals if we hadn't interfered. We made this problem and, while euthanizing them would be expedient, it would an abdication of our responsibility. Without a doubt, our domestication of cats is part of the equation and changes the debate, but I have seen people on both sides of the debate take that issue into their ethical consideration. The people who are arguing that feral cats should be trapped, neutered/spayed, and then released are definitely (and rightly) pointing out our responsibility in having created the problem of feral cats in the first place. On the other hand, the people who argue that the native birds and small mammals should take precedent in this debate are saying that because the cats have been domesticated and are in essence an invasive, non-native species, that they are less important to the overall maintenance of biodiversity. Personally, I disagree with euthanizing the cats, but I don't think that I've arrived at that point of view in a way that's more ethically based than many of the people who have arrived at the opposite. Wait, Quinoa is so valuable that the people who make it are suffering because they can make more money from selling it instead of eating it...? There's a step missing here in the this logic. Well, I imagine the people who actually own the farmlands and production are profiting, but its demand has priced it out of range for less wealthy consumers. The article also mentions that the demand has put pressure on farmers to harvest quinoa exclusively, encouraging a monoculture crop culture instead of a more diverse farming plan. Found this via your link at Feministe and this is really fantastic. It's measured and thoughtful. I feel like those of us in the online activist community have real problems seeing things in shades of grey sometimes, so I really appreciated this. I can see each side, but in my mind, the thing that sticks out is how we'd treat this (and how we *do* treat this) when it's humans instead of cats. We may not be out killing birds with our teeth and claws, but we are causing extinction of species and destruction of habitat far worse than the kitties are doing. I am strongly opposed to anthropocentricism, and I don't think we should advocate anything for animals that we can't swallow for our species. We have came out strongly against euthanasia of humans for all reasons other than the most humane (extreme suffering, long-term coma, etc) so obviously it must be wrong. And since the moral superiority of humans to other animals cannot be proven, it's no good to argue that humans should somehow be exempt from the rules other species are, or that they deserve special treatment. Regarding the quinoa "debate": there are actually other ways to get protein besides quinoa and meat! Like for instance lentils! And black beans! They're less expensive too! And much more convenient than deer for non-gun-owners!